Hexahedral crystalline prisms. Blue cyan sky variety of beryl. 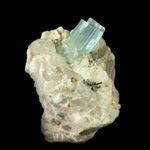 The name of aquamarine happened from Latin aqua marina is salt water, as a color of stone reminds warm tropical seas. Got the name for colouring which depends on maintenance of ions of iron Fe. Once aquamarines were decorate tsar's crowns, they were used as lenses for glasses (the first lenses are dated 1300 by a year). In the bright sunshine gradually pale turn color and burns down to colourless. 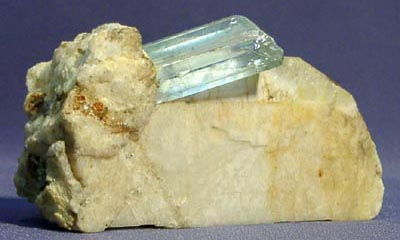 The color of aquamarine can be brighter at artificial or evening illumination. 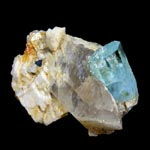 It is very unsimple to distinguish aquamarines from blue topazs and quartz. Aquamarines can be got from not valuable greenish beryls their heating to 400-500oC, thus to distinguish them from natural extremely difficultly. 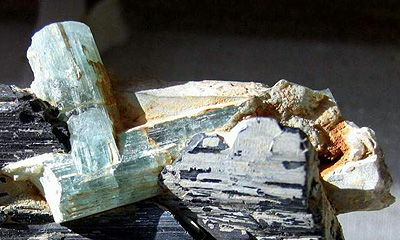 The large crystals of aquamarine often used for a screw-thread and making of the different dear hand-made articles of large sizes. 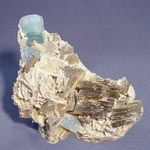 Aquamarines from different mine deposits differ colouring - from celestial-blue to navy blue. Dark blue tones are incident to the crystals of Ural and Transbaikalia, green-dark blue - crystals of Ilmenskiy mountains. 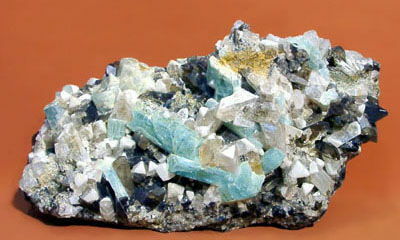 The finds of aquamarines are known in pegmatites of Volhynia (Ukraine). Wonderful quality bluish-green and blue aquamarines are widespread in Brazil; a booty makes them approximately half of world. There are they and in Democratic Republic Madagascar, Nigeria, Zimbabwe, in a some of the states of the USA and other Colouring of aquamarines is conditioned isomorphous included in the structure of beryls ions of iron Fe of Fe2+ and Fe3+. 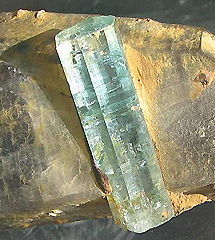 Sometimes there are very large crystals of aquamarine. In Brazil in state Minas-zherays is found one of the largest aquamarines of "Maram-bayya" by mass 110 kg and long 48,5 sm Large Aquamarine by mass 82 kg was discovered in 1796 in East Zabaykal'e. As a rule, crystals blue beryls turbid thousand cracks, them hammered in mini-canals the bubbles of liquid and gas, quartz is "healed", shallow mica or other late minerals overgrew. Besides characteristic for all of beryls of the gas-liquid including, often located in the thin ductings (under a microscope they look as hexahedral), in aquamarines sometimes there are solid inclusion of white color, urgent "chrysanthemums" and "snow signs", layers of shallow crystals, thin needle-shaped inclusion. All of them can serve as diagnostic signs. Important, that exactly ability of aquamarines to form the extraordinarily large crystals of jeweller quality advantageously selects them in the world of jewels, where an account usually goes to the carats. In jeweller wares solidity to distinguish faceted aquamarines from natural blue topazs, synthetic spinel and quartz, glass. Berilly of unusual deep sapphire-dark blue color were found in 1917 in the state Minas-zherays in Brazil on the mine of Maksiks and were adopted Aquamarines- maxis (mashishe). This color arises up under act of radiation. 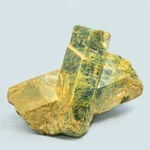 However much colouring of crystals appeared unsteady: by the daily light it or collapsed or became yellow and tawny. To-zhe same takes a place with the radiation-exposed aquamarines. The dark blue colouring of aquamarines is extremely unsteady. 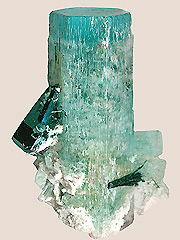 It is considered that Aquamarine is able to tame a raging sea (green cyan sky). It is a talisman of faithful love, guarding friendship and saving justice. Talisman of people passionate and stormy, and also travelers and loving changing impressions. Amulet of sea-folk, non-load-bearing from troubles on water and giving victory in battles. Aquamarine is a daryl friendship, mutual understanding, reasonableness and eloquence. As guarded - one of the best from spoilage and other. 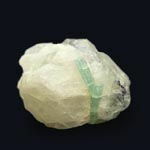 Aquamarine brings a proprietor possibility to comprehend itself and expose the errors, grasp secrets, disrobe false friends and other deceptions. Stone is very useful lazy people: it unnoticed does their intently-attentive and gives a desire to operate. In antiquity and in middle ages considered the amulet of happy matrimonial unions. In France newlyweds were exchanged rings with aquamarine, trusting that due to it their life will pass in mutual love and respect, as Aquamarine possesses by force to turn the ideas of the possessor to that, who complimented with him the beloved. Stone must be mounted in silver.